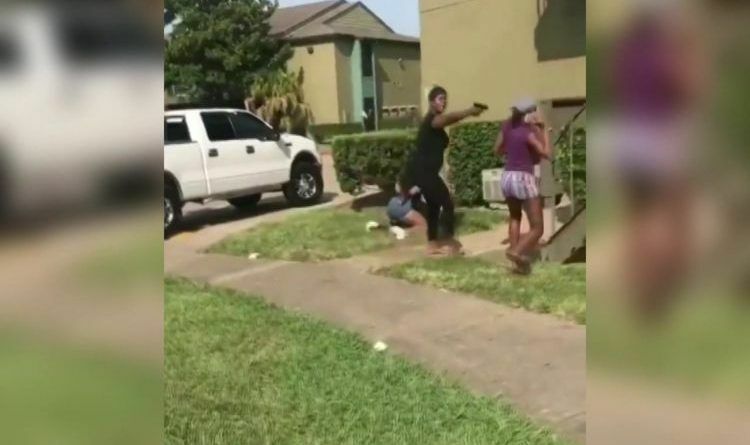 A Snapchat video recorded at an apartment complex in southeast Houston has gone viral. A mom pulled out a BB gun during a fight between her teenage daughter and another girl because she claimed that the girl’s family brought knives with them. Chade Lockett, the mother of the 13-year-old girl, was also there and claims she was trying to break up the fight. Watch the video below! “She pulled a gun out on us. We were frightened for our lives. My niece was basically out there getting harmed by an adult. She’s 15. The girl is 13. They’re both teens, they fight and get into it. That’s what teens do, but the mom, she had no reason to put her hands on her or anything like that,” the woman who recorded the video, Veneisha Jones, said. Lockett says the video does not tell the entire story, and that the weapon she was holding was her son’s toy gun. Lockett told that she was just trying to protect her daughter. “I’m doing what a mother should do – which is protect your child, and y’all trying to make it seem like y’all didn’t do anything,” Lockett said. I’m shocked. This is disgusting! A BB gun is considered a deadly weapon in Texas courts. If the facts show the use of knives as Lockett indicates, the production of any firearm or BB gun can be seen as legal in defense of third person or one’s self. Further, this short statute is often missed by most people. ← Tim Allen’s ‘Last Man Standing’ Will Officially Return Next Month And Will Include A Huge Surprise For Every Conservative In Our Country!